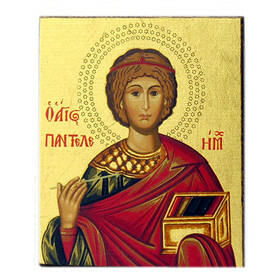 Greek Ceramic & Icons :: Byzantine Art - Greek Icons :: S7235x6 Saint Pontelimon The Healer Serigraph Greek Icon Icon Bronze Leaf 2 1/4"x2"
HomeGreek Ceramic & IconsByzantine Art - Greek IconsS7235x6 Saint Pontelimon The Healer Serigraph Greek Icon Icon Bronze Leaf 2 1/4"x2"
S7235x6 Saint Pontelimon The Healer Serigraph Greek Icon Icon Bronze Leaf 2 1/4"x2"
The icon’s gold background is from bronze leaf and applied by hand to icon board. This icon is a "WINDOW INTO THE ETERNAL" It evokes the look and feel of an original hand-painted Byzantine icon. Each icon is a reproduction of an original Byzantine styled icon from a museum or monastery in the Christian East. This icon was meticulously and reverently created by hand, using traditional forms and materials in a unique and contemporary serigraphic procedure.